Thanks to Warracknabeal SC and DET Virtual Learning Coach, Butch, for this blogpost. Warracknabeal Secondary College recently had a virtual visit from its SIS partner Dr. Peter Nichols from CSIRO Food & Nutrition and Oceans & Atmosphere based in Hobart. Dr Nichols spoke to the Year 10/11 Chemistry class on his specialty area of Oils Chemistry. He described his role as a member of a CSIRO team working to incorporate specific algal omega-3 genes into land plants including canola to produce fish oil like levels of the health-benefitting long-chain omega-3 oils. Such plants can in the future supply sustainable sources of these ‘good oils’ for use in feeds, food products, supplements and pharmaceuticals. The CSIRO research team was the first group in the world to achieve the production of DHA, one of the main long-chain omega-3 oils, in an oilseed. In a world first, the Australian partner of CSIRO, Nuseed a subsidiary of Nufarm, commenced field trials of the DHA-containing canola in Horsham in mid 2014. The field trials follow on from the successful transfer of the plants from CSIRO to Horsham and their testing in greenhouse trials. This makes the connection and discussion even more ‘real’ for the Wimmera students. Dr Nichols also spoke about his career path and interest in science to the class. The Science in Schools session with WSC will continue in the future to expose students to ‘real’ science through connections with an external expert which includes demonstrations of experiments using oils analytical equipment at CSIRO. Warracknabeal Secondary College thanks Peter for his time in visiting our college to support its students through the SIS program. 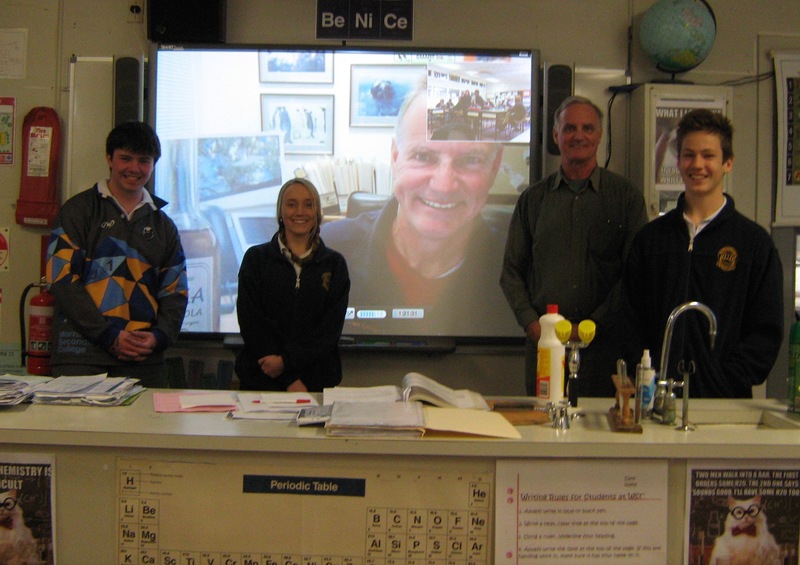 SIS partnership between WSC, Warracknabeal, Victoria and CSIRO Hobart – Virtual visit from Dr Nichols in Hobart (centre) to Warracknabeal where John teaches his students (from left): Matt Stephensen, Courtney Arnott and Isaac McPherson. In case you hadn’t picked the similarity, Peter Nichols is John’s identical twin brother.